Here at the end of the New 52 Green Lantern Corps, I remain fascinated by this title. Under Peter Tomasi and Patrick Gleason, as you've heard me say ad nauseum, Corps was one of my favorite titles, and it's been less so with Van Jensen, Bernard Chang, and colorist Marcelo Maiolo. At the same time, I recognize there's strength in Chang and Maiolo's work on this title, and the story Jensen presents in Green Lantern Corps Vol. 6: Reckoning is interesting for John Stewart fans, if not possibly maddening too. I liked the Green Lantern "Godhead" crossover overall, though Reckoning by itself offers a lesser reading experience than Green Lantern Vol. 6: The Life Equation. That book can more or less be read on its own, while Reckoning lacks both "Godhead"'s starting chapter (found only in the Godhead trade proper) and also the Green Lantern Annual conclusion. This book devotes three issues to "Godhead" and then does tell a full concluding three-issue story, but I'm skeptical anyone would want to read this for "Godhead" without also at least Green Lantern and also the Sinestro issues. There are a number of interesting bits in Corps's "Godhead" material. What stood out to me the most was Reckoning's uncommon pairing of Green Lantern John Stewart and Sinestro; the villain has traditionally vexed Hal Jordan and bickered with Kyle Rayner, but Stewart and Sinestro isn't a team-up we normally see. And this is Jensen's calm, troubled Stewart and the current anti-hero Sinestro, in some ways more evenly matched than Sinestro and Jordan's emotional turmoil (which "Godhead" also has, too). Coupled with the idea later in the book that Stewart might actually lead the whole Corps, seeing Stewart and Sinestro trying to corral the green and yellow lanterns side by side is interesting. There's also plenty of potential in John Stewart becoming the first male Star Sapphire. Stewart has a grudge against the Sapphires since they brainwashed Fatality into a relationship with him, and Jensen obviously moves toward resolution in Stewart becoming one of their ilk. Stewart's a character that's been kicked in the teeth too often lately, the veritable punching bag of the Green Lantern titles, of which the Sapphires' betrayal is just the latest; unfortunately, even as the Sapphire ring factors into this book's conclusion, the issue with Fatality isn't really resolved, though I appreciate that Jensen didn't leave it totally fallow. Again, the "Godhead" issues here don't read perfectly one after another the way that those in Green Lantern do. There's a neat trick between the first and second issues where the Corps are transported away at the end of one and arrive somewhere at the beginning of the second, though in truth they have a stop in between in the Sinestro book. The next break isn't as clean, since second issue ends with them escaping trouble and the third starts with them as prisoners. And the end of the third issue has the Corps taking the fight to the New Gods pseudo-conclusively, but then the fourth issue picks up in "Godhead"'s aftermath. Jensen's final three-issue story goes back to spotlight the new Lantern recruits that he introduced at the beginning of his run: warrior Jruk; Feska, a single mother and thief; and the diminutive Maro. As Jruk's planet got a story earlier, now Jensen takes us to Feska's Zarox and introduces us to her mother and son. I continue to appreciate that Jensen created a Green Lantern parent who leaves her child behind to protect the galaxy, not unlike actual active duty military, and those who rooted for a relationship between Jruk and Feska get a treat at the end. Jensen also brings back Durlan Green Lantern Von Daggle, an old favorite I didn't think we'd see again, and I was happy about that as well. But there is a bit of controversial retroactive continuity in Jensen's conclusion. It might equally be considered new continuity establishment, since pre-Flashpoint stories like Cosmic Odyssey aren't necessarily in continuity in the New 52 unless specifically established as such. Jensen posits that the destruction of the planet Xanshi, originally due to John Stewart's overconfidence, instead came from a bomb that seemed to be Stewart's fault at the time, but he learns now it actually wasn't. As well, Jensen strongly suggests that Stewart's once-wife Katma Tui died in Xanshi's explosion when originally, and ironically, she was killed by a Star Sapphire. In the first iteration, Xanshi's destruction was actually Stewart's fault and he had to learn to live with the guilt; now Jensen reveals it wasn't, absolving Stewart but also removing a key and long-standing aspect of his personality. Even as I believe Stewart has perhaps faced one too many tragedies, I can't quite accept Jensen removing this defining one. Good for John Stewart that he's no longer responsible for genocide as he flies off triumphantly at the end of this book, but once more I'd rather have seen Jensen delve further into the Star Sapphire issue than undo years of history here. 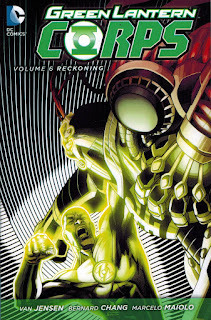 Green Lantern Corps Vol. 6: Reckoning doesn't end exceptionally strongly; if it were not for the continuity twists, the "planet of the week" story might not be that notable. At the same time what Jensen does do with continuity is notable, and also that Jensen reprises his new Lanterns brings his run appropriately full circle. Bernard Chang continues his expansive, broad-lined figures here, which aren't necessarily my favorite but do look good, especially, in his depictions of Highfather and the New Gods. I still struggle with Maiolo's use of flat color panels, but I acknowledge the effect is distinctive and unique, and I thought the flat colors reflected the various colored Corps better here than previous. John Stewart fans take note of this book, for better or worse; I'm reminded, if nothing else, that I'd like to see a collection of Green Lantern: Mosaic one of these days. Wait, so there are issues collected in the Godhead trade that arn't collected anywhere else? Are they important? Yes and, unfortunately, yes. The very first issue of "Godhead," the Green Lantern/New Gods: Godhead #1 issue, is only collected in the Godhead trade. It's important -- it sets up the premise of the story, even as it's mostly action sequences (seeing the various franchise artists together is cool though). Also the Green Lantern annual that ends the whole thing is only in Godhead and the Green Lantern book and not in any of the others. I will say that Green Lantern, New Guardians, and Red Lanterns kind of, sort of, read OK in the individual series issues all on their own. Corps doesn't, and I don't think Sinestro does (I'll have to look again at that one). Totally agree. I finally finished this volume a little while ago, and boy does it not read well. Still haven't gotten around to getting the Godhead trade, but GL read okay. This didn't, I was really lost during the Godhead issues, and the last storyline to wrap up John's storyline felt really rushed. Altogether this was a disappointing volume to end a good series. I have liked Venditti's work over in Green Lantern and I'm optimistic what he'll do with the whole Corps, including John Stewart, in the new "Rebirth" series. Nothing in the New 52 Green Lantern continuity technically makes any sense since the Death of Superman never occurred, so overriding Cosmic Odyssey doesn't really surprise me. I miss Darkstars, too. I remember the end of that series being very strong. I thought John being a Marine was a recent thing, like late Geoff Johns era, and not something that would have been valid when John was a Darkstar. Frankly I've felt in Corps of late that there's been an overemphasis on John as sniper/soldier/Marine that wouldn't be bad per se for a new character, but back in the Green Lantern/Judd Winick era I remember John being primarily an architect, and his personality being much lighter and more of an artist-type in camaraderie with Kyle Rayner. Part of what's made Corps drag for me under Jensen and even in some of the late Tomasi/Bedard issues, is this harried, depressed John Stewart, which maybe reflects some of his earliest iterations but not the Darkstars-era John whom I enjoyed very much as a character. The destruction of Coast City did happen in the New 52 continuity, although it doesn't seem to be connected to the Death of Superman anymore. They just blame Mongul for it instead of Cyborg Superman.